During the final days of the MODINICE crowdfunding campaign, we would like to inform you about the developments of the last few weeks. We can already say that we have reached one of the most important milestones. Having focused primarily on the final details concerning the production of the MODINICE M1 PC during this year's first months, we received the first major batch consisting of 92 PCs in late March. We consciously decided to postpone delivery of the first batch and kept this batch relatively small so that we would still be able to optimize the final details directly in the production process. In this way, we want to achieve the highest quality and customer satisfaction rate possible. As of now, the entire first batch has been pre-ordered, and most of the devices have also been delivered. Initial customer feedback has been overwhelmingly positive and has caused us to be optimistic about the future. In particular, we would like to thank those customers who have provided us with constructive feedback. Retailers in particular are increasingly recognizing the opportunity our PC provides to them. On average, we receive 3-5 inquiries from new retailers per week (without having invested in any significant advertising activities). Moreover, there are other, very cost-efficient marketing activities: We have agreed on our first sales partnership with NEC Display Solutions Europe. Thanks to its large product portfolio, NEC is one of the leading players within the display market. From roughly mid-May/late May, we will bundle the M1 with two NEC displays and promote it using NEC's sales channels. Once we receive the second batch in May, we will gradually ramp up our advertising activities. While doing so, we will act cautiously: As we are able to cover our fixed costs if we sell as few as 35 M1 per month, we can keep advertising costs at an appropriate level and grow as fast as we can afford. Our lean structure enables us to reach profitability by selling only a few units. Consequently, we have reached the proof-of-concept stage and have already passed a crucial stage of new ventures. MODINICE has received the "Best of 2016" innovation award in the hardware category from a German initiative supporting SMEs. This initiative gives the award to innovative solutions that are particularly relevant to SMEs. Our relatively young company's success story has also convinced our friends and families. Therefore, there are additional people who intend to participate in our success by investing in MODINICE. The terms of these people's investments will be similar to those of the Companists' investments. We will announce any direct investments here on Companisto. Finally, we look forward to the final stage of our funding campaign! 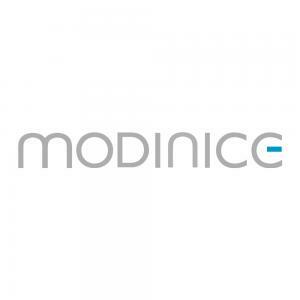 Please register in order to see the complete profile of MODINICE.